If you want some excitement on your next visit to the Smokies, try your hand at a Zip Line Tour AKA Canopy tour. We have all seen it in the tree tops of Costa Rica but the popularity throughout the years has brought some of the best facilities right here to the United States. The fact that Western NC is covered with mountains and huge trees it truly provides an epic location for some of the best canopy tours in the country. Over the last three years we have seen a number of high quality facilities open world class Zip Line Tours for travelers to experience. If you make a great decision and rent one of our Cabins in NC you will have access to zip lining and many other outdoor activities within a short distance of your doorstep. NOC Zip Line Adventure Park - Brand new and due to open June 15, 2012. The NOC is offering Zip Line Tours much cheaper than other facilities. Stand alone reservations can be arranged for $49 per person and if booked along with another tour (ie., whiter water rafting) the price drops to $39. If you are interested in booking this please let us know and we will be more than happy to make the reservation. Wildwater - First to the Nantahala Gorge and they do a great job with their tours. Located about 25 minutes from Sunset Farm Cabins. 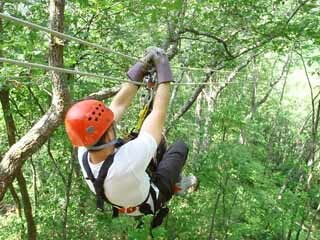 Navitat Canopy Tours - This is a phenominal canopy tour experience located about 20 minutes north of Asheville which is about an hour and 15 minutes from the cabins. 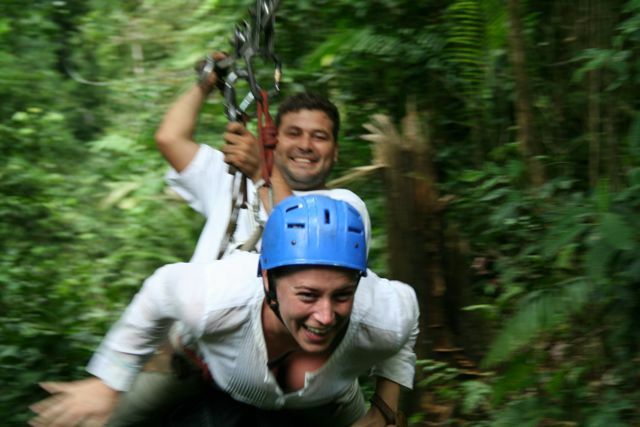 For guests that would like to experience a longer tour and huge zip lines this is the more extreme of the canopy tour experiences. The drive is much further but you have the option on visiting the great city of Asheville at the same time. Return to find more Things to Do in NC.